Substantively, Tristan und Isolde is no less evocative of the sea than Der fliegende Holländer, and this has rarely if ever been more apparent than in Sir Thomas Beecham’s (1879 – 1961) management of this performance. The lapping of the waves against the hull of the ship is felt in Act One, though not via the nausea-inducing fluctuations in pitch that afflict other labels’ editions of this performance, and the chill of the Cornish climate slashes in the orchestra during Brangäne’s Watch in Act Two. So attuned are Beecham’s tempi to nuances of both text and orchestration that the listener can virtually sense, even after seventy-eight years, the sloshing of Brangäne’s fateful potion in the cup, the night air caressing the faces of Tristan and Isolde in their love duet, and the cold penetration of Melot’s sword. As in most recordings of Covent Garden performances of similar vintages, neither the orchestral playing nor the choral singing is absolutely first-rate in these performances [in addition to a complete performance consisting of the combined music from the 18 and 22 June broadcasts, Caniell provides an embarrassment of riches by also including the complete Act Two from the 22 June performance on a bonus disc—gratis! ], but the standards that Beecham achieved are often little short of miraculous. Few conductors whose approaches to Tristan und Isolde are preserved on records have mastered both the nuances and the broader construction of the score as Beecham does in these performances, and appreciation of this is intensified by the fact that the momentum that builds in Acts One and Two from the 18 June performance continues unabated in Act Three from the 22 June performance, there being virtually no indications in terms of dramatic impetus that the opera’s concluding Act is drawn from a different show. This should not suggest that there are any deficiencies of spontaneity or individuality in Beecham’s conducting. Rather, there are abiding consistencies of emphasis and dramatic thrust that are possible only with absolute familiarity with the score. In Beecham’s handling, the famous Tristan chord seems not so much a musical innovation as an inevitable musical linchpin in the tonal construction of the opera as a whole. The dramatic significance of the augmented intervals and harmonic suspension throughout the score is intuitively highlighted by Beecham, and his conducting of the Vorspiel that begins the opera spawns incredible tension that persists until the last bar of the Liebestod. The Liebestod is at once the most extraordinary portion of Beecham’s Tristan and the zenith of Caniell’s endeavors. The severely-cracked condition of the original source disc necessitated punctilious conservation in order to faithfully reproduce the singular authority of Beecham’s reading of the scene. The mammoth crescendi with which Beecham resolves the musical quandaries of love’s transcendence—crescendi too ambitious for HMV’s microphones—here thunder forth as Beecham intended. Were there no other recordings of Beecham’s conducting, neither his groundbreaking Berlioz nor Händel, no Zauberflöte with Lemnitz and Rosvaenge or Bohème with de los Ángeles and Björling, this Covent Garden Tristan und Isolde would more than suffice as proof of Beecham’s genius. When first heard as the Stimme eines jungen Seemanns in ‘Westwärts schweift der Blick; ostwärts streicht das Schiff’ at the start of Act One, Welsh tenor Parry Jones (1891 – 1963), a versatile singer who both was a member of the D’Oyly Carte company and sang parts as heavy as Waldemar in Schönberg’s Gurre-Lieder and Wagner’s Tannhäuser, sounds slightly out of sorts, but his forwardly-placed timbre makes a strong impression in his voicing of ‘Wehe, wehe, du Wind! – Weh, ach wehe, mein Kind! – Irische Maid, du wilde, minnige Maid!’ The voice of Flagstad spreads into the auditorium like the wings of a great eagle with her exclamation of ‘Wer wagt mich zu höhnen?’ Who, indeed, might dare to mock such a woman? Berlin-born mezzo-soprano Margarete Klose (1899 – 1968) was among the few singers of the Twentieth Century endowed by nature with a voice appropriate for Brangäne, and she here sings the rôle splendidly, often stunningly, beginning with a beautifully-projected ‘Blaue Streifen stiegen im Osten auf’ that shudders with enigmatic unease. She responds to Flagstad’s volcanic singing of ‘Zerschlag es dies trotzige Schiff, des zerschellten Trümmer verschling’s!’ with frenzied intensity in her voicing of ‘O weh! Ach! Ach des Übels, das ich geahnt!’ Their interview is interrupted by the Seemann, whose ‘Frisch weht der Wind der Heimat zu’ Jones sings lyrically. As Isolde gazes at Tristan, Flagstad’s phrasing of ‘Mir erkoren, mir verloren, hehr und heil, kühn und feig!’ is magical, the meter and Leitmotiv already unmistakably foreshadowing the Liebestod. The innocence of Klose’s ‘Frägst du nach Tristan, teure Frau?’ is answered by the harsh determination of Flagstad’s ‘Der zagend von dem Streiche sich flüchtet, wo er kann, weil eine Braut er als Leiche für seinen Herrn gewann!’ There is poetry even in Kurwenal’s brief warning to Tristan as Brangäne approaches, ‘Hab acht, Tristan! Botschaft von Isolde,’ as sung by Herbert Janssen (1892 – 1965), who—unsurprisingly to anyone who has heard his Holländer in Immortal Performances’ recording of the Coronation Season Der fliegende Holländer—is an uncommonly thoughtful Kurwenal. From his first ‘Was ist? Isolde?’ as he receives the nervous Brangäne, Melchior’s Tristan is, even alongside Flagstad’s Isolde on standard-setting form, the true glory of this recording. The layers of meaning in Tristan’s ‘Was meine Frau mir befehle, treulich sei’s erfüllt’ are conveyed by the sheer loveliness of Melchior’s tone. Taking his cue from Melchior, Janssen devotes attractive sounds to Kurwenal’s goading, dispatching the top Fs in his song with sonorous ease. The history of the 1937 Covent Garden Tristan with Beecham is convoluted, the principal reason being that EMI officials made a mess of their legacy. Although they desperately wanted to record Melchior and Flagstad in this opera, and did in fact record two performances of the complete work on June 18 and June 22, 1937, they managed to retain not one single, unified performance. Some masters were lost, some were damaged. Clearly this was a company whose executives neither knew nor cared what art treasures their vaults held. The result is that this recording is a compilation, with the first two acts coming from the June 18th performance, and the third from June 22nd. We have a different Kurwenal and Brangäne in the third act, but other cast members are the same, and of course Beecham is a constant as well. Prior releases have been less than successful, none worse than EMI’s which mixed up these two performance with a third, from 1936 conducted by Fritz Reiner, and issued the mess as Beecham’s before later admitting to the mistake. Other private labels have more or less gotten the source material mostly right, but with poor sonic results (many at the wrong pitch), and some not knowing that the first act was missing a bit from June 18th near the end, and that they really had June 22nd in that segment too. The June 18th original has, in fact, turned up for that final part of the first act, and is included in this version. More important than getting the individual segments correctly identified is the overriding fact that this is an utterly remarkable performance of Tristan und Isolde, and is available now in a version that so completely supersedes all prior versions as to render them irrelevant. Richard Caniell has given his usual attention to detail, removing hiss, grit and noise to the extent possible but without destroying the color of the voices and the orchestra. Between this and other Flagstad performances, including EMI’s studio version with Furtwängler, we have many choices in hearing the soprano who most would agree was the greatest mid-twentieth century Isolde. If you told me I could take only one to that mythical desert island, I would choose this one (if the Furtwängler had Melchior in his prime as Tristan, my choice might be different). Flagstad is often accused of being matronly, stolid, lacking in passion. To be sure, there are performances of hers that merit at least some of that criticism, though for me it always pales when set against the sheer glory of the voice itself. But this performance, perhaps inspired by Beecham, shows Flagstad not only at her vocal best, but responsive to text and to dramatic moment. She is girlish, she is impassioned, she is anguished, she is furious, she is tender; she is, in short, a complete Isolde. In no prior releases of this performance did her voice glow and shine the way it does in Immortal Performances’s transfer. The rich beauty of her top notes comes through with remarkable impact. We begin to have a hint as to what it must have been like to experience that sound in the opera house. 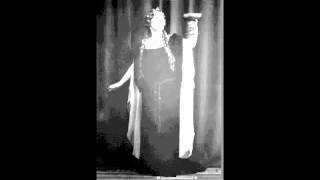 The story of the high Cs in the Furtwängler performance being dubbed in by Schwarzkopf is well known to collectors, and that was a justifiable choice for a great Isolde near the end of her career. But those Cs in this performance, obviously sung by Flagstad, ring gloriously and with a complete sense of vocal freedom, and even triumph. The other prime beneficiary of the superb sonic restoration here is Beecham, or rather Beecham and the orchestra. No other edition of this performance offers this degree of richness and variety of orchestral color, this dynamic range, and in particular this beauty of string tone. Just getting the pitch right has made a huge difference, but opening up the orchestral sound has clarified the stature of this performance. Listen to the orchestra after the drinking of the potion, as it virtually explodes with passion. This is a score in which tension and release is crucial—particularly the long build-up of tension in the second act—and Beecham is a master of that element. It is, in fact, in the balance that he achieves between urgency and tenderness, between the intimate and the grand, along with his innate feel for phrase-shaping, that Beecham achieves something very special here. In Caniell’s thorough and candid commentary, he points out the peculiarly uninvolved playing of the orchestra leading up to the second act meeting of the lovers, and he is quite right, but he is also right in stating that is the only point in the entire opera with which one can fault the conducting (this is true, by the way, in both performances of the second act). Beecham does preserve some of what were then traditional cuts in the score (some of which might well have been to take some of the vocal cruelty out of the long third act scene for Tristan), but he cuts much less than Bodansky did. We are fortunate that history has preserved a number of different performances of this opera with Flagstad and Melchior. There are performances conducted by Leinsdorf, Reiner, and Bodansky as well as Beecham. That is an estimable group, but having heard them all it seems to me that it is Beecham who most successfully maintains the enormous architecture of the score, balancing moment-to-moment drama with lyrical beauty and a sense that the music is always headed somewhere. Beecham takes the most risks, daring tempos that range from quite slow to very fast, and making it work because of his strong internal rhythmic pulse and the internal logic of the transitions. That the third act of necessity comes from a performance four days later in and of itself is not seriously troubling. It was the same production, same conductor and orchestra, and same two lead singers. In the opera house there would be a 20 or 25-minute intermission, so to think in terms of direct musical continuity is disingenuous. There is, however, an issue caused by the different Brangäne and Kurwenal, but it is in reality a really unimportant. We are so swept up in the passion generated by Beecham and Melchior, as well as Flagstad at the end, that the change becomes a minor detail. Having the alternative June 22nd version of the second act as a bonus gives us an opportunity to directly compare Branzell and Klose in the same music. Both are strong Brangänes, Klose being a stronger, more forceful presence, Branzell the richer voice of a true contralto, which she uses movingly. As for the two Kurwenals, Janssen has the warmer timbre, Schöffler inflects with more specificity, but both are distinguished singers. All of the subsidiary roles, including Sven Nilsson’s black-voiced and powerful Marke, are done well, and they are never a reason that one listens to, or doesn’t listen to, a performance of Tristan und Isolde. No operatic work depends more on its two principal singers and its conductor for success. What we have here is one of the greatest performances of that opera ever to be captured in recorded form, finally transferred in a way that respects the quality of the music-making and brings it all vividly to life. Richard Caniell also gives us extensive and thoughtful notes that are way beyond what we get in most releases, either by the major record companies or certainly those specializing in historic material. I always appreciate and enjoy the fact that his notes are highly personal in nature. In addition, as a bonus he has included the June 22nd second act, which makes a fascinating comparison, particularly of the two Brangänes. I like both, in different ways, but think I prefer the vocal richness of Klose. Then he adds a bit of spoken commentary by one of the great vocal critics of the past century, John Steane, and a celebratory piece for chorus and orchestra by Ralph Vaughan Williams. I know of no other recording of this work, which makes it all the more valuable. And one must also note the wonderful photographs included in the two accompanying booklets. There are many labels, major companies and small independent producers, that make historic material available. None does it with the consistently high standards of Immortal Performances. Those of us who believe that the history of the art form of opera must be well documented, for our own enjoyment and for future generations, owe this company an enormous debt of gratitude. EMI recorded the performances from June 18 and 22 but no complete recording survived. So what we have is the following. Act 1: 68 minutes from June 18th performance, final 6 minutes from June 22nd performance. The transition from one performance to the other is skilfully done and this edit exists on all issues of act 1 suggesting it was done by EMI engineers back in 1937 perhaps to compensate for a broken or damaged disc. The only way to tell is that the Kurwenal for the final five minutes is Schoffler not Janssen. Act 2: Both the 18th and 22nd June recordings of act 2 are complete – the 18th is taken from the EMI masters that still exist.